Another phase of the Ho-Chunk Nation’s “Project Forward” at Ho-Chunk Gaming Black River Falls has been completed. 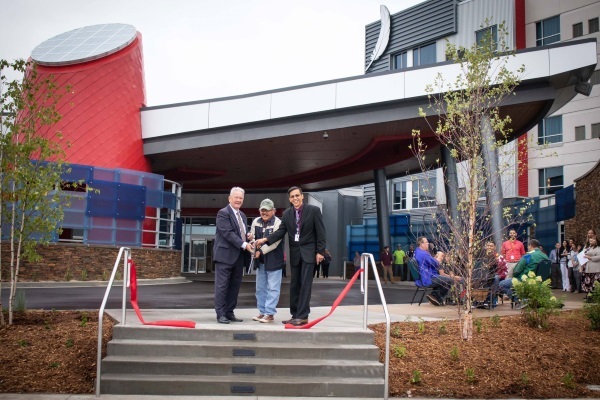 On Friday, August 24, 2018 a ribbon cutting ceremony took place for our Thunderbird inspired Porte Cochere and Veteran’s Memorial Garden. Porte Cochere is a French word for coach gate, used to protect people from the weather elements. Ours is unique in its physical size and appealing structure. The conical feature has lights inside that are beamed upward through blue acrylic, and downward to an organic sand based rock garden. The surrounding secondary walls of the Porte Cochere have multiple lights directed toward their panels that create a multi-colored effect in the evening. The Veteran’s Memorial Garden is an offset from the Porte Cochere on the south east hotel side of the facility. It was designed as a peaceful, and respectable area with five illuminated flags and a plaque giving tribute to some of the Ho-Chunk Nation’s fallen service members. Benches, trees and shrubs have also been added to give serenity to the area. Ho-Chunk Gaming Black River Falls has undergone major renovations and expansion over nearly two years, with ground breaking on September 23, 2016. Completed phases include: gaming floor expansion with 200 additional slots (including a non-smoking section, and high-limits room), brand new hotel and lobby, renovated buffet and bistro, and now the Porte Cochere and Veteran’s Memorial Garden. The Bingo Hall is nearing completion of their renovation, and ATV parking with a wash bay coming in 2019.